Lockheed Martin (NYSE: LMT) has embraced a 3-D printed titanium dome for satellite fuel tanks so big you can’t even put your arms around it. A Lockheed Martin engineer inspects one of the 3-D printed dome prototypes at the company's space facility in Denver. The final dome measures 46 inches in diameter, large enough to fit 74.4 gallons of liquid. Photo is courtesy of Lockheed Martin. The 46-inch- (1.16-meter-) diameter vessel completed final rounds of quality testing this month, ending a multi-year development program to create giant, high-pressure tanks that carry fuel on board satellites. The titanium tank consists of three parts welded together: two 3-D printed domes that serve as caps, plus a variable-length, traditionally-manufactured titanium cylinder that forms the body. The new fuel tank for Lockheed Martin's largest satellites host 3-D printed domes that cap off the cylinder. Using this manufacturing method, tank delivery time went down from two years to three months. Here the tank is seen in a test fixture, with a 3-D printed dome seamlessly integrated into the body of the tank. Photo is courtesy of Lockheed Martin. Satellite fuel tanks must be strong and lightweight to withstand the rigors of launch and decade-long missions in the vacuum of space. That makes titanium an ideal material, but procuring 4-foot-diameter, 4-inch-thick titanium forgings can take a year or more, making them the most challenging and expensive parts of the tank. Traditional manufacturing techniques also meant that more than 80 percent of the material was wasted. Now, 3-D printing eliminates all that lost material for the domes, and the titanium used for printing is readily available with no wait time. Rick Ambrose, Lockheed Martin Space EVP, said that the firm's largest 3-D printed parts to date show the company is committed to a future where satellites are produced twice as fast and at half the cost. Lockheed Martin is pushing forward for even better results. For example, the company saved off 87 percent of the schedule to build the domes, reducing the total delivery timeline from two years to three months. The company self-funded this design and qualification effort as an investment in helping the firm's customers move faster and save costs,. These tanks are part of a total transformation in the way space technology is designed and delivered. Great strides are being made in automation, virtual reality design and commonality across the company's satellite product line. Lockheed Martin customers want greater speed and value without sacrificing capability in orbit, and the company is answering the call. Even the smallest leak or flaw could be catastrophic for a satellite’s operations — Lockheed Martin engineers went to great lengths to ensure the printed tanks meet or exceed the performance and reliability required by NASA. 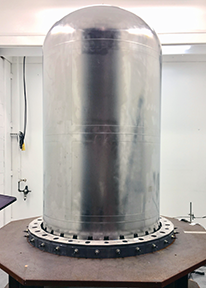 Engineers and technicians rigorously evaluated the structure, conducting a full suite of tests to demonstrate high tolerances and repeatability. 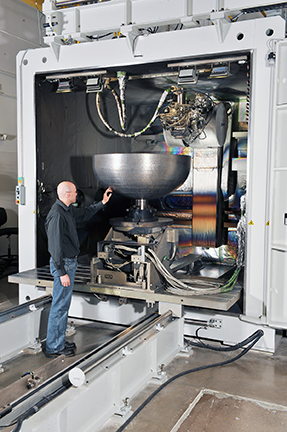 Technicians used Electron Beam Additive Manufacturing® to produce these domes in the largest 3-D printer at the company's facility in Denver. Lockheed Martin now offers the tank as a standard product option for LM 2100 satellite buses.